With a few common tools and a helping hand, you can install your new window air conditioner in no time. Though the process of installing a window air condition typically involves the same basic steps, different models come with slightly different hardware, so it’s important to have the manual on hand. Here is what you’ll need to install your new window air conditioner. Always wait until after you’re finished installing your window air conditioner to plug in the power cord. The unit is not designed to be moved or serviced while it’s live. While you won’t need to disassemble the unit to install it, be aware that the front and rear coils inside the unit have sharp, metal edges. Do not remove the outside casing unless you know what you’re doing. Power drill to drill holes for the screws you will insert. self The size of drill bit to use will depend on the screws that come with the unit. Some units come with self-drilling screws that do not require a drill. Phillips or flat head screwdriver to insert the screws. You may only need one or the other, depending on the screws. Carpenter’s level to ensure you install the unit at the correct angle. Many window air conditioners must tilt downwards outside the window so condensation can drain to the ground. Do You Need Two People to Install a Window Air Conditioner? Installing a window air conditioner does not need to be a two-person job, but we strongly recommend you recruit a friend to help you lift the unit onto the window frame. Window air conditioners can weigh between 50 and 120 pounds (depending on the model), and since one end is typically heavier than the other, they are awkward to handle. Having a second pair of hands will also make it easier to position the unit properly between the sash and the window frame. Practice lifting the unit before you place it on the window to get a feel for the weight distribution, and always use safe lifting techniques. What If I Have a Horizontal Sliding Window? 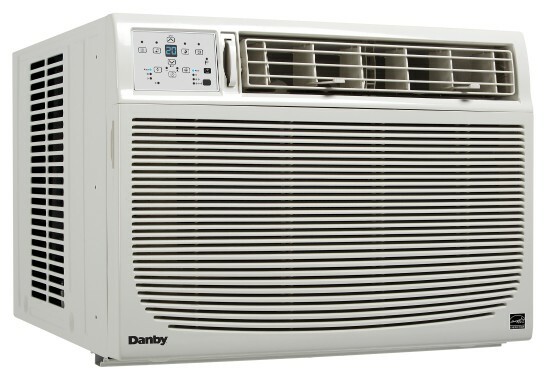 Danby window air conditioners are designed to fit in a window that opens vertically. We do not recommend installing a window air conditioner in a horizontal sliding window, and our product manuals do not provide instructions on how to do it. It’s a matter of safety. For horizontal sliding windows, we recommend using a portable air conditioner instead. Trust us on this one — it’ll be safer, easier to install, and far more effective in keeping you cool. Portable Air Conditioner - The Economical Solution!